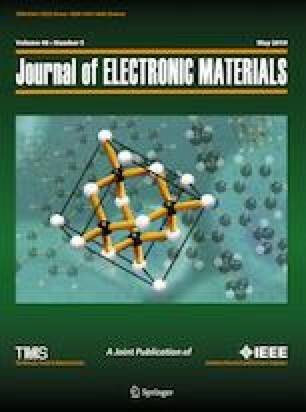 In this study, (1 − x)(K0.5Na0.5)NbO3-xBi(Li1/3Zr2/3)O3 (KNN-BLZ, x = 0, 0.005, 0.01, 0.015, or 0.02) lead-free ceramics were fabricated. The effects of the addition of Bi(Li1/3Zr2/3)O3 on the dielectric properties, microstructure, and phase structure of the KNN ceramics were studied. The structures of KNN ceramics shifted from an orthorhombic to tetragonal phase structure with the addition of Bi(Li1/3Zr2/3)O3. Furthermore, at x = 0.005, the ceramics exhibited good thermal stability (Δε/ε150°C ≤ ± 10%), low dielectric loss (tanΔ < 2.5%), and large relative permittivity (ε ~ 2160) in the temperature range of 154–370°C. Additionally, the electrical properties of the ceramic at high temperatures showed that the basic mechanism of the conduction and relaxation processes was thermal activation, and oxygen vacancies may be one of the mobile charge carriers. Hailin Zhang and Xu Li have contributed equally to this work. This work was supported by the Natural Science Foundation of China (Nos. 11664008 and 11364012), Natural Science Foundation of Guangxi (Nos. 2017GXNSFDA198027 and 2017GXNSFFA198011).